"Differential Extensions (and other strange possibilities) is an experimental electronic sequenced music composition comprising many diverse elements, and structured along approximately rhythmic lines, but also encompassing a certain degree of fluidity. The work is noted for its use of a software frequency shifter to impart some startling changes to the rhythmic and sequenced passages. Unlike a pitch-shifter, a frequency shifter does not preserve the harmonic relationship between the various harmonic elements in the input signal. Because of this process, with only a small degree of frequency shift audio signals start to sound very different and strange to the ear. It was the process of frequency shifting tones that started the inspiration for this work. All tracks were referenced by a 110 bpm tempo track for synchronisation. The OCET Rhythm Synthesizer VST was used extensively, and with the Valhalla Frequency Echo effect and delay a springy rhythm punch was created, a bubbling drippy sequenced track with "spring" sounds, and a strange ringing bongo squelchy sequence were created. The Valhalla frequency effect was also applied to various ring-modulated sinewaves to create a strange "groaning wind" sound - like some nightmarish mountain monster. The Hammerhead Rhythm Station provided additional beats using phasers and flangers for metallic effects. The Ring-O (VST stereo ring modulator) was used in a dual configuration to produce strange "space sounds" by manually tuning the oscillators and processing the output with reverberation. Other sounds include a loop made of processed tones with reverse delay and slowed-down to create bubbling eruptions. A "swooshing" sound was used (pulsating and filtered tones) as background atmospherics. Additional OCET sequences treated by flangers and delay units provided the higher tinkles and other ringing resonate effects. A reverberation track was created (using a sub-mix of the above tracks), and was filtered and sped up at the conclusion of the work together with an echo effect placed at the end. It was the combination of all these tracks that created the surreal rhythmic wash that comprises the music. The visuals comprise various video texture and pattern effects using colourisations, embossing and processed animations to create two video tracks identical to each other but delayed and keyed using luminance values. 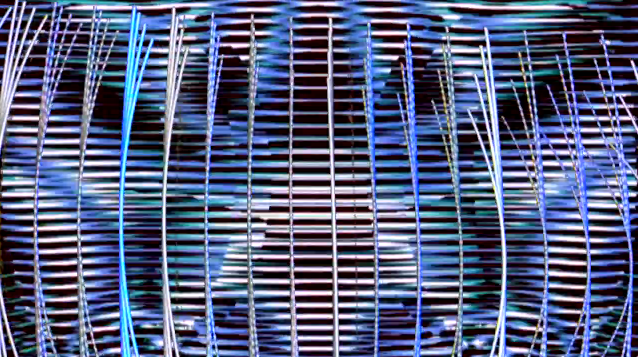 A third video track was used as an effect key track. The visuals pulsate and flash like a disco video backdrop. Pulsating rhythms pulsate with the light show created by video synthesis techniques. The work evolves into a kind of "fluidic space", merging into a different universe where a "white hole" coalesces bringing together all forms of matter, light and energy streams."